A page from the 1913-14 A. Kleszczewski catalog showing two Drillings which were no doubt products of the Suhl gunmakers. Paul Aegidius Kleszczewski is first mentioned as a gun maker around 1885 and his 1913-14 catalog states that he started his business “A. Kleszczewski” in 1885. This business operated as a gun dealer until the end of World War I when Paul passed away. He was a Hungarian who sold guns made by others with his name on them, a common practice at that time. His early advertisements for workers show they were located in Metz. Around 1906 he and his wife Angelika moved to and set up shop in Berlin. Sources state that his shop was located at various times at Berlin SW. 68, Friedrichstraße 55 and also located at Berlin W8, Friedrichstraße 73 and 83. I wish to thank my good friend Axel Eichendorff of Germany for much of the following information. Paul and his wife Angelika apparently used some rather shady business practices over the years and the repercussions of some of these are documented in a lengthy article that appeared in the German periodical Der Waffenschmied. In 1900 Paul developed and advertised a see through shotgun shell which was unsuccessful. It’s hull was made from Celluloid which was itself a highly combustable material. That same year he was convicted of “Unlauterer Wettbewerb” or unfair business practices and fined 200 Marks. He had advertised his business as “Metzer Gewehrfabrik” with pictures of a big factory, but the factory shown was not his. His work shop was located in a single room in his Attic and his entire staff consisted of six people. In 1901 there was a trial which declared Paul Kleszcewski Bankrupt. It appears that his wife Angelika became the owner of the business at this time and Paul became the manager because he was not allowed to conduct business under his name. In 1910 the German Gunmakers Association ( Verband Deutscher Büchsenmacher) reported Paul to the public prosecutor for “Unlauterer Wettbeweb” again for unfair or fraudulant practices. This stemmed from his advertising of the “Berliner gewehrfabrik” which showed a large factory when in fact the “Factory” was located in the basement of their home with a total area of 7 x 27 meters. The machinery consisted of two hand or Foot power Lathes. Seven people worked at the business and Paul admitted that they had manufactered 20 guns between 1900 and 1910 which averages out to two guns per year. This practice of showing a facility that was much larger than it was in reality was not confined to this maker-dealer. Many other makers followed this practice also by showing a factory building with very small people, vehicles or trains around it to give the impression that the building was bigger than it really was but not to the extreme that Kleszczewski did. Around this same time Paul also put out an advertisement offering many brand new guns and related items at greatly reduced prices. When a customer asked for one of these sale items they were told that it was “already sold” or were handed not a new item but a used or second hand one. The customer was then offered a new item at the regular full price. Obviously a shady ploy to get customers into their shop. After Paul passed away around 1918 his widow Angelika Kleszewski continued operating the business with his son. In later years it was a Sporting Goods and Photographic shop which finally closed around 1973. By clicking Here you can view a 1913-14 Catalog that is courtesy of the Georgia (the country, not the state) State Library and www.shotguncollector.com. You will note the the header of the catalog pages shows the business name as “A. Kleszcewski” referring to Pauls wife Angelika as the firms principal. It shows many guns made by other firms. 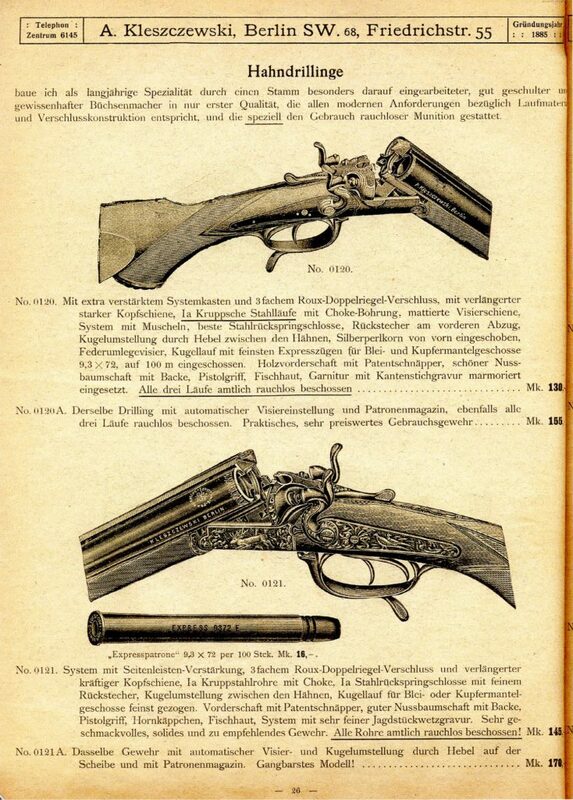 Two known examples are the Record side by side shotgun with dual side by side lugs which was designed by Franz Jaeger and was refferred to as the Simson-Jaeger Verschluss and was made in Lüttich, Belgium by the Scholberg & Delheid firm and the Meffert side by side shotgun with the grip safety which was produced in Suhl. I have no doubt that they used another firms existing catalog and had the printers add thier name to the catalog header and the guns pictured.